No! This isn’t a typo! This cake DOES comprise of TWO different cheesecakes! I think I have an affinity with mangos and coconuts. I don’t know what it is about them, but they are just one of the most divine combinations ever!! Don’t look at me! I’m not the only one who thinks so! Another huge fan of the two, Jinnie, requested such a cake for her birthday. Thus I decided to whip up said cake by going on my recipe excavation. After a long and hard research, I decided to piece together recipes from different websites into one final masterpiece! This is my own recipe inspired from the pumpkin cheesecake I made before. I merely replaced the pumpkin puree with mango puree. Since the consistency of the mango puree is thinner than the pumpkin puree, I reduced the amount of "wet ingredients". NOTE: You can also make this cheesecake even without a springform pan!! I didn’t have a square springform pan and thus I lined my cheesecake with parchment paper instead. Of course you need to be careful when removing the cheesecake. I used a large spatula to assist me. Combine room temperature cream cheese, sugar and vanilla essence in large bowl, mix until smooth with a fork or an electric mixer at the lowest speed. I always prefer to use a fork. Pour into the crust. With the *water bath method, bake for 70 min or till the top turns a bit darker. *Water Bath method: Place another pan bigger than your cheesecake directly below the springform pan. Pour boiling water onto the pan. It will help keep the cheesecake moist and discourage cracks. Leave your cheesecake to cool for about 2 hours, then refrigerate for a minimum of 4 hours, preferably longer. 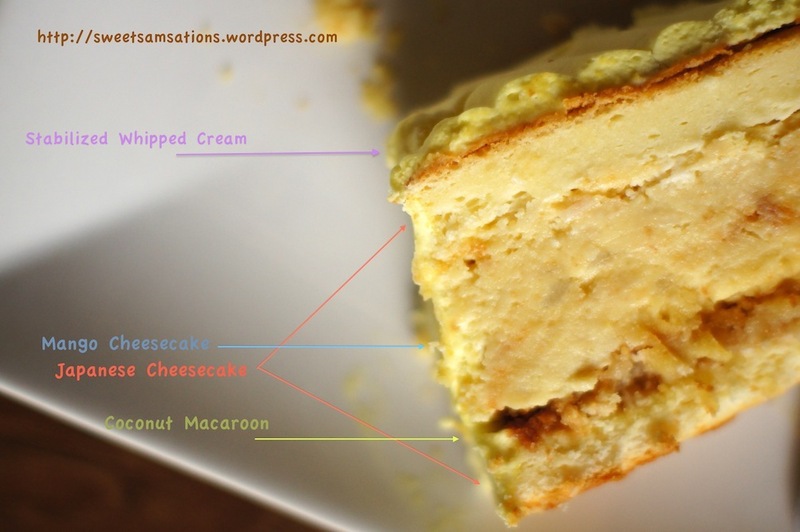 While your cheesecake is in the oven, you can make the coconut macaroon layer. This is very simple and quick recipe! Nonono! This is not the French Macarons I’ve made before here and here! They’re Coconut Macaroooooooons! These are Jin’s favourite! Aren’t they a great idea for a cake component? Combine sugar, flour, salt and coconut in a mixing bowl. Stir slightly so all dry ingredients are nicely blended. Stir in egg whites and almond extract. Mix well. You can use vanilla extract if you wish. Scoop into an aluminium sheet and press down shaping it into a square. Bake at 325 degrees for 15 minutes or until the edges of the cookies are golden brown. I quickly placed it in the oven while the cheesecake was baking. It was ready in no time!! If anything, this probably took the longest time out of all the components! 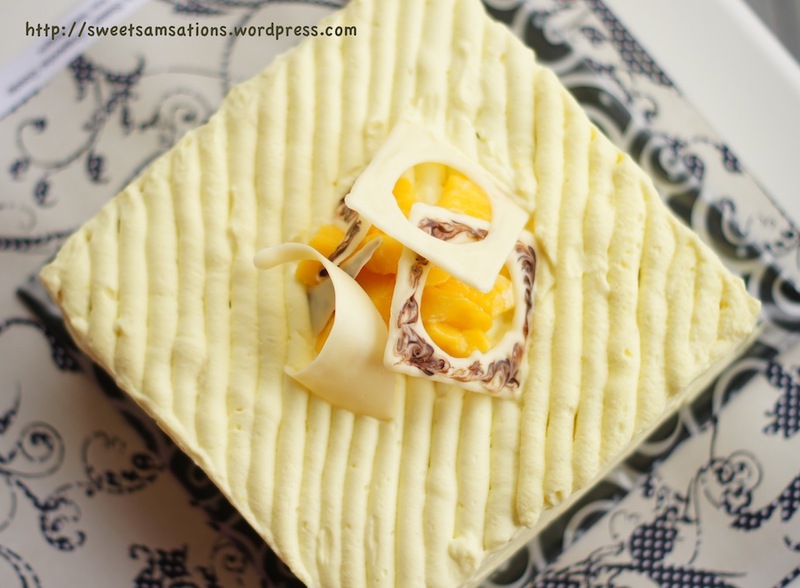 I think it’s a GREAT recipe and I would really love to give it another try, because this time, I wasn’t able to taste its true flavour due to the overpowering mango cheesecake. I halved the recipe stated as I wanted thinner layers. I believe my layers also somewhat shrunk after I refrigerated them and stacked the other layers on top! nooooo… 😥 haha.. But it still tasted great! The texture was also soft, a little creamy, and delish! Will definitely attempt again! adapted from Ju. Hers looks great! Preheat the oven at 325°F. (Wait until your mango cheesecake is done!) Melt cream cheese, butter and milk over a double boiler. Cool the mixture. Beat eggs and mix in. 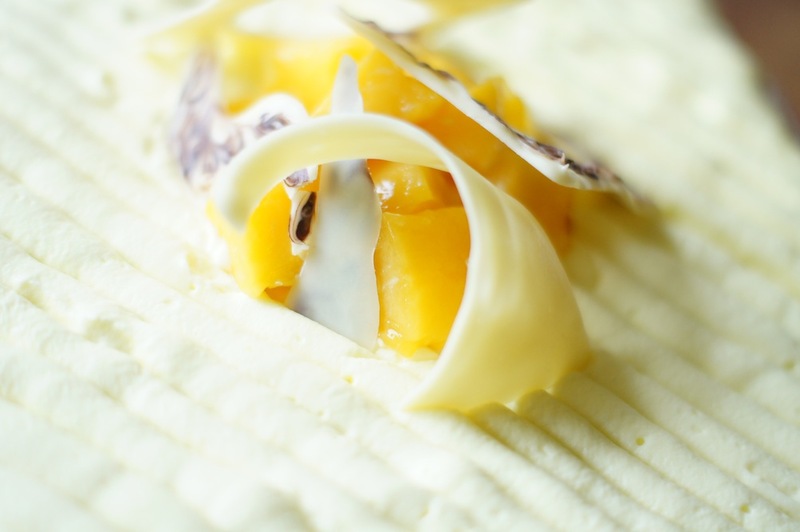 Fold in the flour, the cornflour, salt, egg yolks and mix well. Whisk egg whites with cream of tartar until foamy. Add in the sugar and whisk until soft peaks form. Add the egg whites to the cheese mixture and fold well. You can bake it in 2 separate 8 inch square pans or in one and then torte it horizontally afterwards. (lightly grease and line the bottom and sides of the pan with greaseproof baking paper or parchment paper). I baked mine in one pan because I hate lining the pan with baking paper! haha..
Bake cheesecake in a water bath for 1 hour 10 mins or until set and golden brown at 325°F. Leave to cool in oven with door ajar, about 30mins to 1 hour. Sudden changes in temperature may cause the cake to cool too quickly and collapse. Meanwhile I started making my chocolate templates!! You can refer to my previous post to see how it is done. After your cakes have all cooled down, it’s time to make your whipped cream!! I piped my whipped cream according to a design I first saw on Gourmet Baking and have tried it on a Strawberry Shortcake. I loved it so much, I had to do it again…! So, ta daaah! If you are only frosting the exterior, this recipe is sufficient. If you decide to frost between the layers, you will need to double the recipe. Dissolve gelatin by microwaving for 2 minutes, stirring after every half minute. Remove from microwave and let stand at room temperature for 10 minutes, then refrigerate for 2 minutes; gelatin must be liquid but not warm when added to cream. Note: Time of cooling will depend on your room temperature! It’s summer here now, so it took a bit longer and I had to refrigerate it for about 3 minutes. Add gelatin mixture to cream, pouring in a steady stream while beating constantly. Beat until stiff peaks form. Use immediately. Finally, it’s time to assemble your cake! The results were wonderful! And I was so happy that I danced around the kitchen and took a billion pictures (as usual). Jinnie really loved the cake too! She said it was the best birthday cake she’s ever had! Other friends who tried the cake said they loved it too! 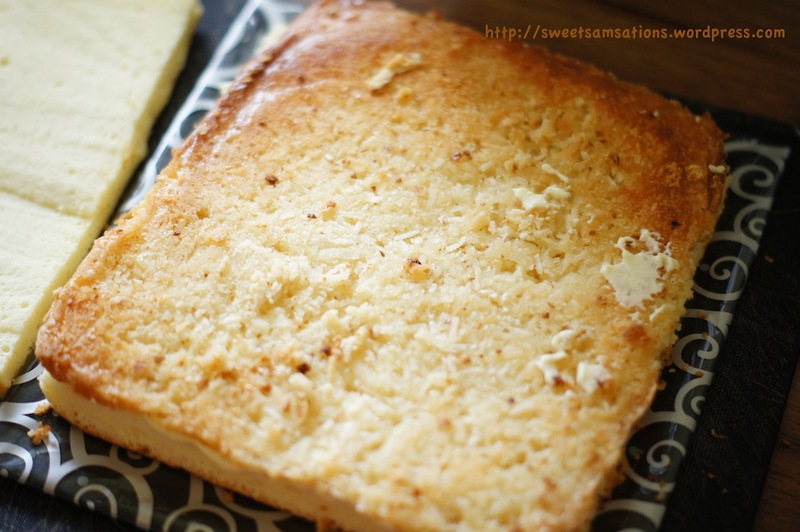 Jinnie and I loved the coconut macaroon layer and thought it was an ingenious idea. However, non-coconut lovers commented that the coconut layer was a detractor to the otherwise perfect cake. Anyway, I’m glad she liked it! Alright, I will be submitting my final submission to Aspiring Bakers #18: Layers of Love (April 2012), my “Layered Cake” event I’m hosting. The deadline will also be on April 30th! Hope to see yours! 😀 I’ve received a lot of wonderful cakes now! The round up will be on May 1st. That’s all for now, see ya soon! Gorgeous sweet delights as always! Love the pics and the recipes 🙂 my sponge that I made today has nothing on our gourmet delight! I know what you mean! I’m impressed by the details in the purée and mousse you add too. Keeping it stable on a cake base is no mean feat! Plus you always have the most lovely flowers in your pictures too..
Aww! Thanks CCU! That’s so sweet of you! Alot of effort went into this amazing cake, however, I can see that it was worth every minute! I was just commenting on another blog that as bloggers, sometimes a big project in the kitchen is just what we want. Great flavor elements and textures, this is definitely bakery quality. Happy birthday to Jinnie! She is lucky to have a talented friend like yourself. I have to tell you that I wish that I had a birthday cake like this. Mine cake last year does not even compare with this beauty. Happy Friday! Exactly! Especially when it’s for someone’s birthday, we like spending hours and hours in the kitchen making different components and putting them together! haha.. Thank you for your kind comments Tina! PS- Enjoy your time in Hawaii, that is a great place to visit. I hope you will post about your travels! Definitely! Can’t wait to try the food there! yay..! This is such a genius creation! I love the combination of two different types of cheesecakes, I will definitely try it out soon – I’ve been baking with too much chocolate lately haha. Have fun on your trip, hope to see some photos from beautiful Hawaii! Haha my friends are totally opposite! They adore chocolate, so sometimes it’s hard to convince them to eat non-chocolate cakes! Thank you!! Yeah! I’m a huge fan of tropical flavours since I grew up with the most tropical climate ever. haha.. Thanks Charlie! I like it! You have such unique cakes and combinations that anything you put together comes out excellent! haha.. Thank you for your kind comment!! 😀 It made me smile! Wow, awesome layered cake. At lot of steps but I am sure it tasted great! Thanks Sonia! Yes, it did require a lot of work! haha.. Thanks Bam!!! Nahh…. I’m no professional! I’ve yet to receive my first Wedding Cake order! If I do, then I will consider myself a somewhat professional baker! lol. For now it’s just my over-obsessive hobby! awww! Thank you Courtney! So sweet of you! 🙂 Moving not totally done yet!! Still a lot to clean up. ughhh… It’s really incredible how much junk all of us have. We keep things because we can’t bear to throw them away. And they pretty much just sit there.. until we have to move and throw them out. lol. That is a masterpiece! Fantastic and delicious. Really looks so amazing! Welp, this cake is beyond stunning! Sounds and looks incredible. Best of luck with the move and have so much fun in Hawaii–jealous!! Thanks so much Caroline!! Luck!! I really need that! Moving is suuuuuuch a pain that I feel like I never want to move again. lol. But in a way it’s great because it forces you to clean and throw away junk! If it is possible, you have outdone yourself with this one!! I’m speechless 🙂 Gorgeous! Thanks Deb! 🙂 I’m glad you think so! hehe..
Sam! You make the most AMAZING cakes. You need to open a bakery….you know this right? 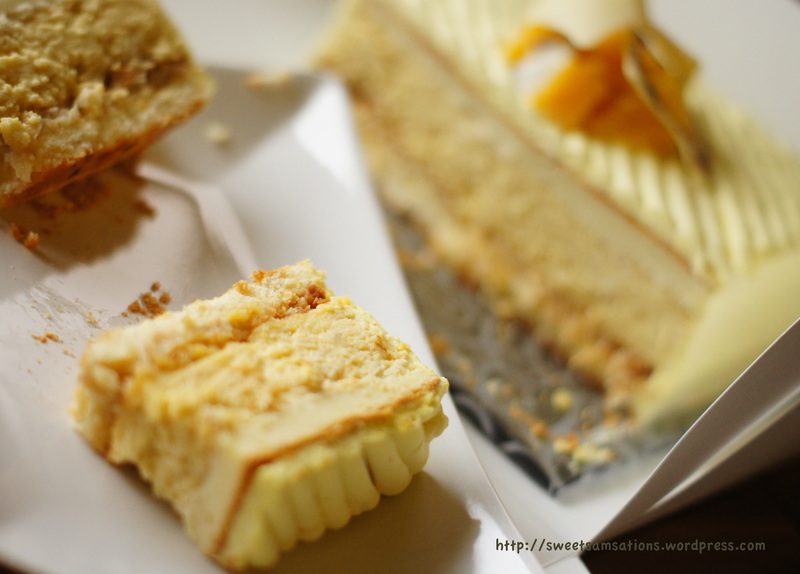 My sister has visited your blog also and loves your cakes and your photography. She says your photos belong in a magazine. I agree! Hi Donna. That’s the sweetest comment ever! I’m so happy to hear that! That’s a huuuuge compliment! haha.. Still lots of room for improvement for my photography and baking. But that’s the fun of it. Although I have to say that I do spend a looooooot of time on them, which is why I blog less frequently! lol. Thank you thank you! Oh my goodness! For someone who loves all things creamy and cheese – this is a winner. The photos just beckon its sweetness. Thanks Claudia! ooohh.. me too! 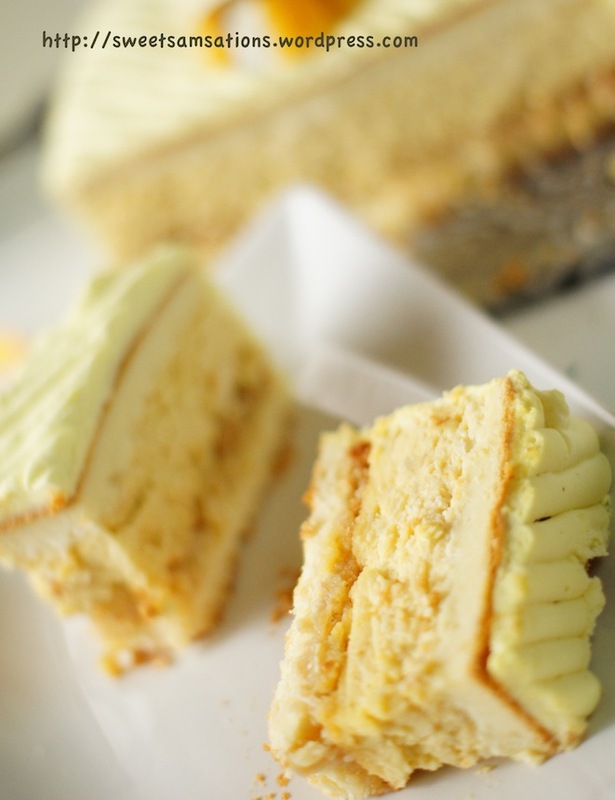 I love adding cream cheese to my cakes! hehe.. Thank you! Amazing, Sam! Love the details with your chocolate decorations! 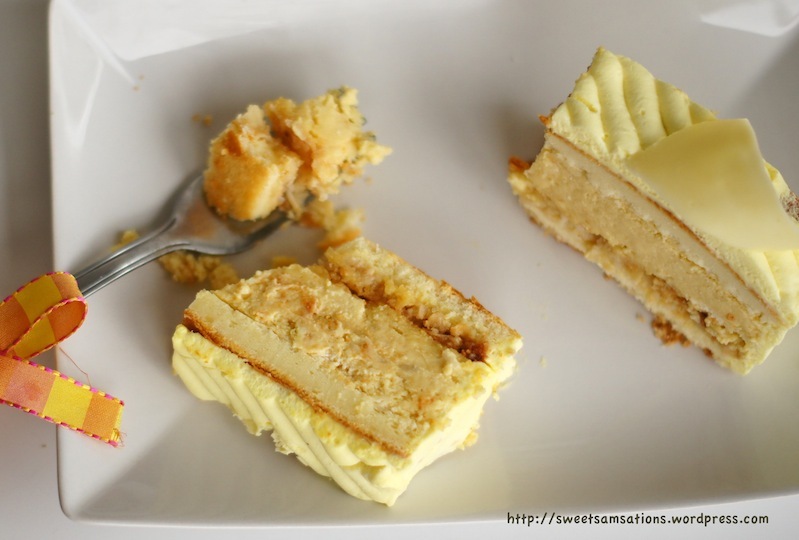 You will be so inspired by the desserts in Hawaii…lilikoi and guava cakes, yum! Thanks Lorraine! hahaa.. A little experimentation I did there. 😀 I’m glad it turned out okay!! 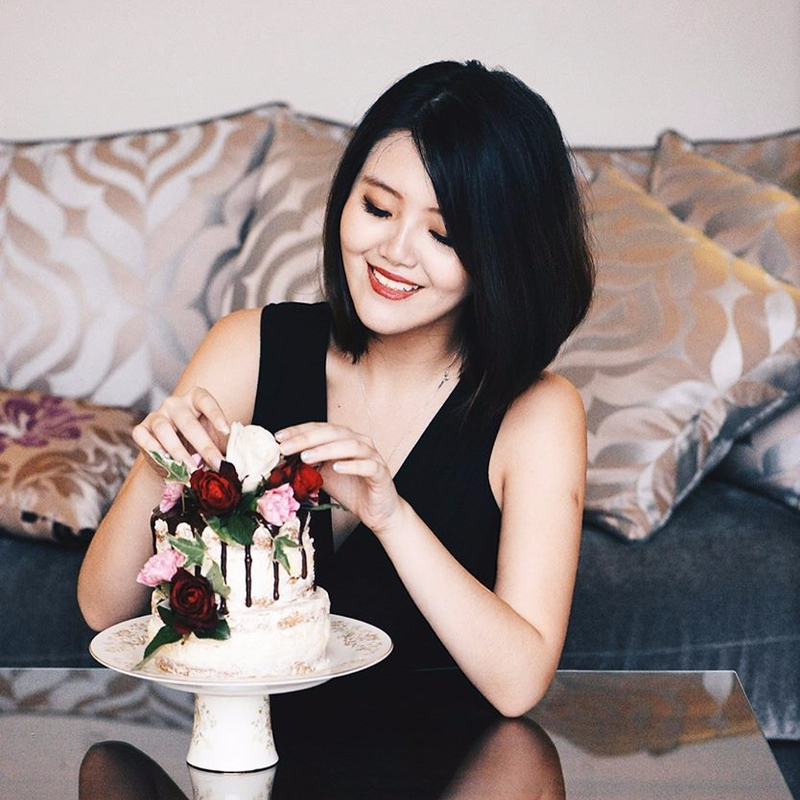 haha..
What an incredibly gorgeous cake, and so much life put into each painstaking layer; your friend Jin is lucky! I would love such a cake for my birthday. Thanks Eva! haha.. I think I learned a lot from this cake too! Glad she liked it! Thanks! Thank you Chung-Ah! Oh I’m so glad that you like it! Your comment made me smile! Thank you! Sam, Sam, Sam. You make me wanna cry, how can I get hold of that. It looks so absolutely divine, really! That looks seriously yummy! And I admire your dedication in making all the various bits. Thank you! Hopefully this dedications stays for a while. lol..
Sam that looks fabulous!!!! 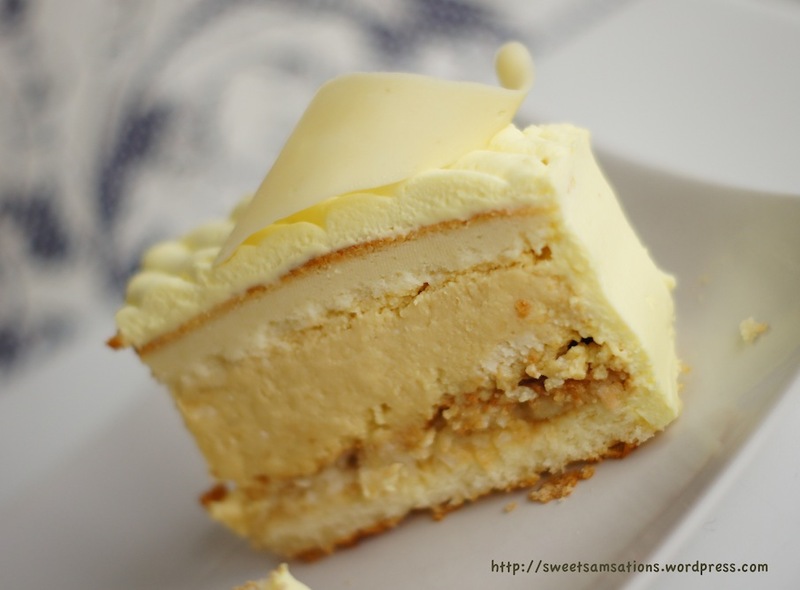 I love mango and I love coconut and I love cheesecake so I know this cake is perfect for me! I have to find the time to make this. You keep raising the bar with your wonderful creations. It’s so nice that you are generous enough to share these wonderful desserts with the world. I agree with everyone else, you need to open a bakery and it needs to be near my house! Feel free to overnight me this cake, any time 🙂 I think this looks absolutely wonderful. PS – So jealous that you’re heading to Hawaii! I want a vacation! Thank you!!! haha.. I know! I’ve been waiting to go to Hawaii! I heard many great things about it! I think half my excitement is in the food too! lol. can’t wait to try native Hawaiin dishes and fusion Japanese food! You are incredible! You have outdone yourself. It is always a treat to see your posts. Great job! OMG, Sam,…that is one of the most gorgeous cheesecakes I’ve ever seen, and the mango with the coconut macaroon crust is brilliant! Is the Japanese cheesecake filling the same as cotton cheesecake? I’ve always wanted to try that! wow this cheesecake is really a piece of art and besides it sounds amazing so fresh and delicious! Sam, you are so incredibly talented. This cake blows me away both in beauty and flavor profile. So gorgeous…so delicious. 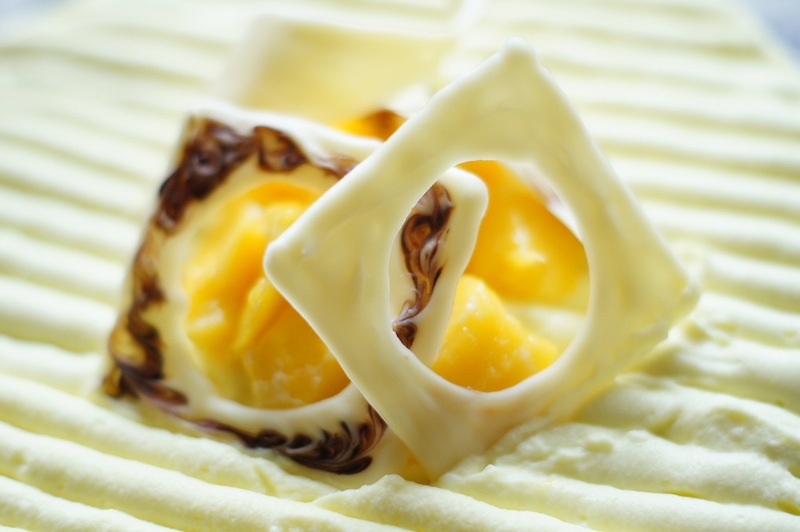 The decorations of white chocolate are exquisite and I adore the idea of the Japanese cheesecake layer. Oh. my. oh wow, this looks fantastic! i love mango + coconut together, so this sounds like pure perfection to me. by the way, my birthday is friday in case you want to send a slice to me! 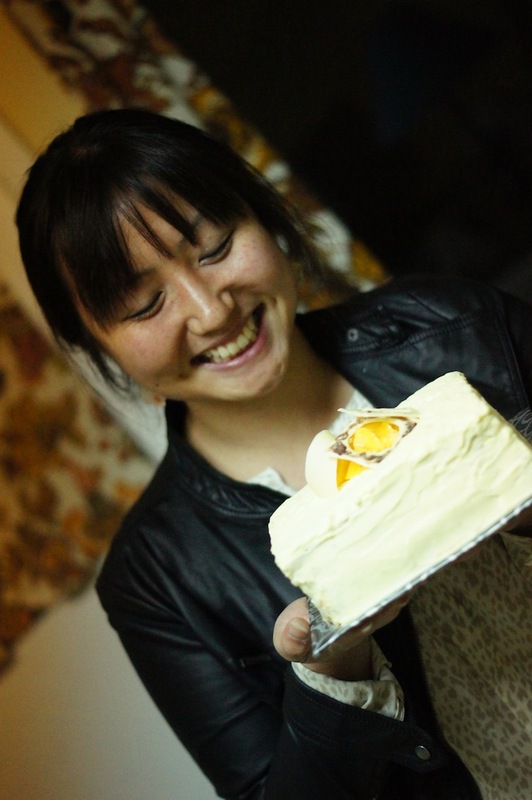 =) your friends are lucky to have such a great birthday-cake maker! Thank you! oooh!! Your birthday is coming up! You must be so excited! hehe. I’m usually excited about the cakes when my birthday’s coming up! hahaha.. Thank you Amy!! 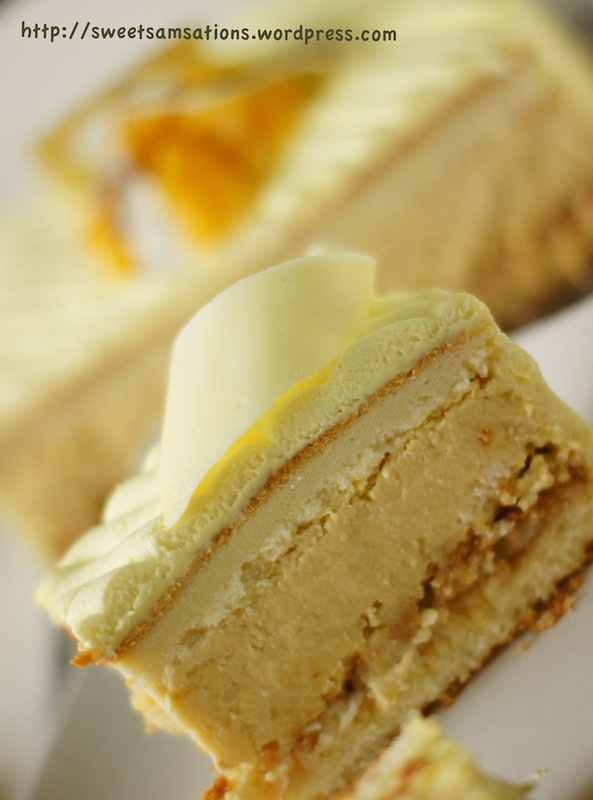 I’ve been searching high and low for a mango cheesecake dessert. and this. Is. IT. In love! This is just perfection! 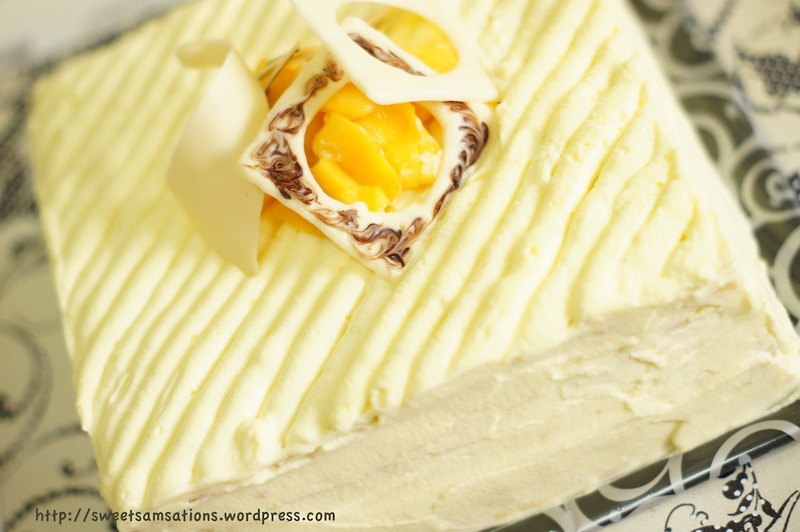 Mango cheesecake – two of my new favorite words! Thank you!! Surprisingly mangoes aren’t a popular flavour in cheesecakes in North America! hehe.. I think this is the nicest designed cake you have made yet BB! Hi Sammie, This is a super cake. I can’t believe how all these deliciousness compact in one cake. This is fabulous!! Thanks Nami!! Awww! You’re always so sweet and encouraging! …. and fabulous too!! 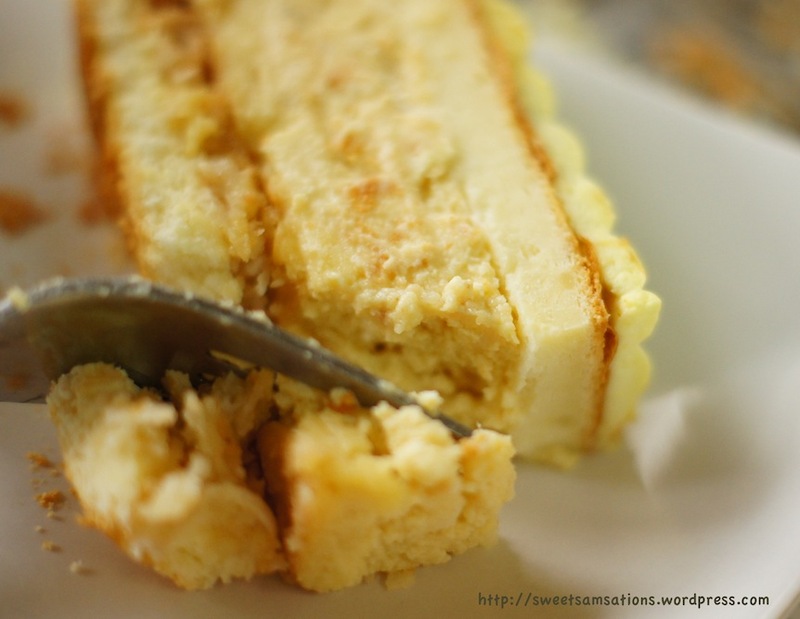 By the way, you should try the Japanese Cheesecake layer!! It’s really yum yum! What an absolute work of art. Just beautiful and it must be delicious. Love you sammie! Thank you for the cake! best birthday cake ever!!!!!!!!!!!!!!!!!! Welcome Jinnie Baby!! ❤ Happy B'day! This is stunningly beautiful. Am really in love with this. Aww! Thank you!! That’s very nice to hear!